Record your personal working times up-to-the minute with the InLoox PM stop watch. Afterwards, you can book the recorded working time to a project. This facilitates the consistent and complete documentation of activities for purposes such as billing. 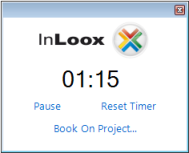 Click the InLoox PM tab on the Outlook Ribbon and then Stop Watch in the Extras group. Now, the stop watch box is displayed at the bottom. Click Start to start recording. You can pause the time tracking by clicking Pause. You can reset the stop watch by clicking Reset. Click Add to Project..., if you have finished time tracking. In the project list, choose a project, to which you want to add the time tracking entry. Use the analitycal filter to display only projects that meet the defined criterion. For more information, see Search and find projects, in the Use filters section. Use the command Recent projects. The drop-down list displays projects you opened recently, organized by numbers. Click Clear selection, if you want to change the choice. Fill in the New Item dialog box with the required information. For more information see Create and edit a time tracking entry. The context menu contains several commands to adjust the project list view. Right-click in the project list to open the context menu. How to record personal working hours with InLoox PM 8 • Copyright 1999-2019 © InLoox, Inc. All rights reserved.